It's been two years since Adobe unveiled a new version of Photoshop, so it shouldn't come as a surprise that the company's engineers have been toiling away behind the scenes on a major update. The outfit's clearly ready to start showing off the fruits of its labor, though, as it just unveiled the beta version of CS6. All told, the outfit's added 65 user-feedback-inspired features, including a new crop tool, expanded video editing options, auto recovery and the ability to search for specific layers. Fans of the dotted lines in Illustrator now get the same vector tools in Photoshop. 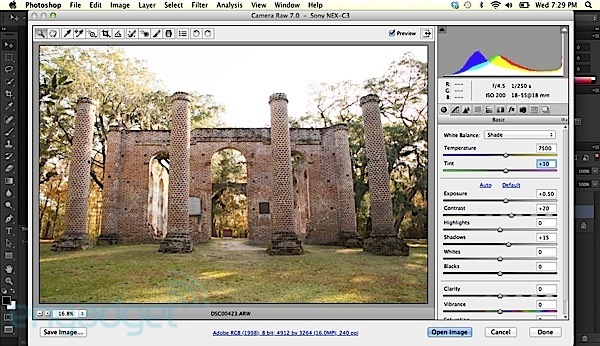 Additionally, every slider for the Camera Raw 7.0 plug-in (exposure, contrast, etc.) has a freshly tweaked algorithm. And for anyone who's ever looked on helplessly as Photoshop locked itself up during a long file save, projects can now save in the background while you work on other things. Looking for more info? A brief rundown of the beta and a full list of new features await you just past the break. Adobe's also made some refinements to existing features. The liquify tool, for instance, now has a larger maximum brush size, and works in real time so you can see the effect in real time. 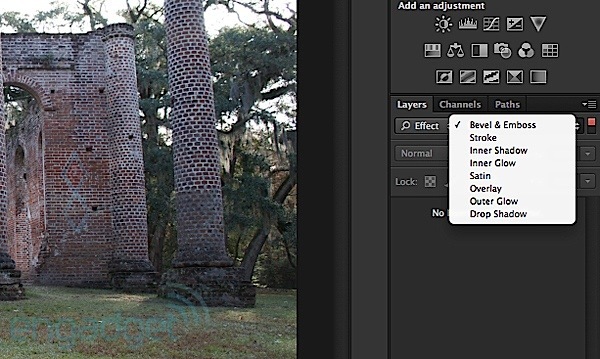 Adobe's also added two features to complement Content-Aware Fill, which was first introduced with CS5. These include one for moving objects to different part of the image, and one for patching up a spot with content taken from another part of the picture. With change comes some potential readjusting, though. In addition to adding more functionality, Adobe's overhauled the UI so that it has a dark background by default (this is customizable, to an extent) with a generally cleaner smattering of icons and menus. Even the setup process has been overhauled: now, users must sign in with an Adobe ID before installing the software. Though there are contingencies for people without an internet connection, the idea is that people will enjoy more efficient support if they don't have to fumble around for a long-lost serial number. There's one thing that hasn't changed and that's pricing. When this goes on sale it'll cost $699 as a standalone product, and $999 for the extended version. For now, though, you can download the free beta (it's only available as an English- and Japanese-language program for now). If you only have two minutes, we've also got the full PR after the break, along with an official list of new features and tweaks. SAN JOSE, Calif., - March 22, 2012 - Adobe Systems Incorporated (Nasdaq:ADBE) today announced Adobe® Photoshop® CS6 beta, a preview of what's to come in the next release of the industry standard in digital imaging, is available as a free download from Adobe Labs. Customers can download the beta, try out the experience and provide feedback to the product team. Packed with groundbreaking new innovations, features and incredible performance enhancements, Photoshop CS6 beta is available for the Mac OS and Microsoft® Windows® platforms. The final release is expected in the first half of 2012. "Photoshop CS6 will be a milestone release that pushes the boundaries of imaging innovation with incredible speed and performance," said Winston Hendrickson, vice president products, Creative Media Solutions, Adobe. "We couldn't wait to share this beta of Photoshop CS6 with our customers and are looking forward to hearing from them and seeing the ways they are incorporating the beta into their daily creative workflows." Photoshop CS6 beta demonstrates Adobe's focus on huge performance enhancements, imaging magic and creativity tools that offer customers a new experience in digital imaging. Key features include new additions to the Content-Aware tools: Content-Aware Patch allows greater control by letting users select and duplicate an area of an image to fill in or "patch" another. Content-Aware Move lets users select and magically move an object to a new place in the image. Customers will experience incredible performance, powered by the new Adobe Mercury Graphics Engine*, enabling near-instant results from popular editing tools including Liquify, Puppet Warp, Transform and Lighting Effects; and a refined, modern interface featuring dark UI options to make images pop. New and re-engineered design tools make creating designs faster and more efficient. Vector layers allow users to apply dashed lines and gradient strokes, searchable layers help quickly zero in on any layer you need, and new type styles let designers quickly apply type treatments to their designs. In addition, the Photoshop CS6 beta offers all the features of Adobe Photoshop CS6 and Adobe Photoshop CS6 Extended, such as new 3D editing features and quantitative imaging analysis capabilities. 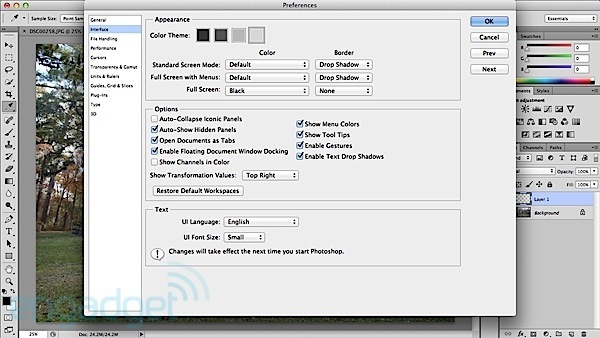 These features will be included in the shipping version of Photoshop CS6 Extended when it becomes available. The Photoshop CS6 beta is available immediately as a free download in English and Japanese. At installation, users will be required to provide an Adobe ID to complete a one-time login and online product activation. For information on how to install Photoshop CS6 beta visit . Customers can submit feedback via the Photoshop CS6 beta forum: http://www.adobe.com/go/pscs6_forum. Users can also connect with the Photoshop team via the community-powered site: http://feedback.photoshop.com; on Facebook: http://www.facebook.com/Photoshop; YouTube: http://www.youtube.com/photoshop; Photoshop.com blog: http://blogs.adobe.com/photoshopdotcom/; or via Twitter: http://twitter.com/photoshop. Adobe Photoshop and Photoshop Extended are at the heart of the Photoshop family, joined by solutions for users at every level who want to bring out the best in their digital images either at home, in the office or on the go. Coupled with Adobe Photoshop, the recently released Adobe Photoshop Lightroom 4 addresses the workflow needs of amateur and professional photographers, helping them create, manage and showcase images in impactful ways. Adobe Photoshop Elements provides consumers with powerful yet easy-to-use tools that organize, edit, create and share photos memories. For mobile devices, the Adobe Photoshop Touch app transforms images with core Photoshop features custom-built for tablets; and Photoshop Express is a free app for simple photo fixes and enhancements, and sharing to social networks.